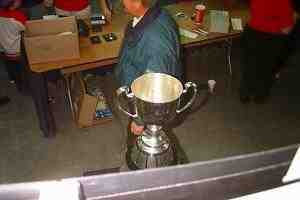 As promised, the exclusive Inside Story on the Grey Cup. Hey, it is mighty clean in there. Waaaay cleaner than the inside of this coffee cup of mine. Well, that's about a wrap. Oh, and shiny. Did we mention shiny? Shiny. And clean. Okay, that's about it. Back to you.